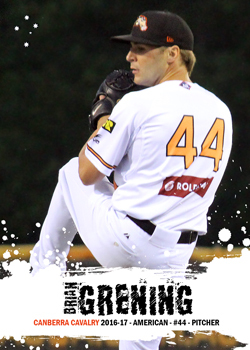 Grening has setup a fairly standard playing routine now of spending the northern summers playing for the Southern Maryland Blue Crabs in the independent Atlantic League, and the Canberra Cavalry in the southern summers. The 2016-17 ABL season was Grening's sixth ABL season. He married in 2016, his wife coming from Canberra, and he commented that he pretty much considers Canberra to be his home field now. I'm pretty sure that he even qualified under last season's revised import rules to play as an Aussie due to his long tenure with the club. His 2016-17 ABL season was cut short however by a stint with Leones del Caracas in the Venezuelan League.